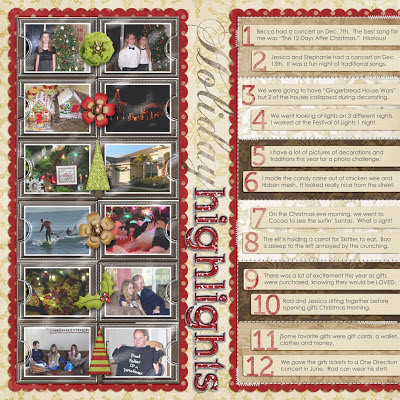 Christmas, traditions, and a long list of "want to do" kept me pretty busy. I'm embarrassed to say that I still need to get 'thank you' cards written and mailed off. Stamped might even be good but I do have my trusty box of ready-made cards that never seem quite right for the person I need a card for. In December I tried to participate in 2 photo challenges for the month. I ended up very behind and was still playing catch-up well into January. There were some duplicates on both lists and I found I got pictures of the details but didn't seem to get as many of the people and I'm usually better at that. Somehow, I need to find that happy medium of both. I like the details but the people/family are more important to me.